Labs aren’t born in a day. Neither are researchers. Braden Zink, a senior biology major, could tell story after story about just that. He came to Mizzou with little knowledge of university research but with the determination to get his feet wet. As a member of Ruthie Angelovici’s lab, he did both. With the lab’s goal of improving sustainability and nutritional quality of seeds, Zink has been able to make great strides in plant sciences. His current project is focused on how the size of seeds relate to their metabolic profiles. Last summer, Zink took advantage of working as a full-time researcher at Bond LSC. This information led him to a working hypothesis that metabolic adjustments other than amino acids must be responsible for seed size variation. 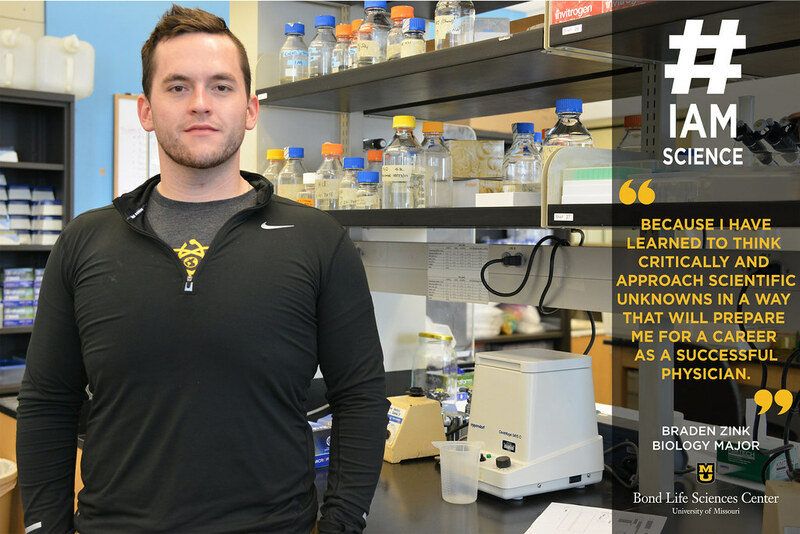 Zink was able to work all summer solely on his research in Bond LSC thanks to the Cherng Summer Scholars grant funded by the founders of Panda Express, who happen to be Mizzou alumni. As one of 12 recipients — making it the most competitive grant for undergraduates — Zink’s dedication to his craft was recognized in a big way. He took his findings from the summer and presented as part of the Missouri EPSCoR program, which is run by the National Science Foundation (NSF) to provide more financial resources to scientifically underfunded states. After the event in late August, Zink was one of 10 presenters chosen to move forward and share their work in front of a national committee of NSF scientists. As the only undergraduate student selected from the state, it was an exciting opportunity. While his accomplishments as an undergraduate researcher speak for themselves, Zink’s next step is medical school. Zink plans to incorporate the lessons he’s learned at Bond LSC on his path to becoming a cardiologist. Although there are more discoveries to be made, Zink is happy to contribute what he can to get things moving in the right direction.